Use nested web workers to handle the file uploads. If the browser does not support nested web workers then the subworkers.js polyfill can be used to meet this requirement. To be able to resume a file upload. Resuming an upload will not overwrite the file if it already exists. Please see the original NODE.js version of this article. One of the things that we wanted to do after blogging about Gigabit File uploads with Node.js was to see how we could improve the performance of the application. In the previous version of the application the code that was written was mostly synchronous and as a result of that we had high CPU usage, did quite a lot of I/O, and used up a fair amount of memory. All in all what was created had more to do with demonstrating the concept of how to do the Gigabit File uploads over HTTP rather than for performance. Now that we have established the concept it is now time to see how the application's performance can be improved. Getting a list of computers to run the script against - You know the drill and that meant using a cmdlet to get a list of computers from either a csv file, or a text file, or the command line. Getting the information for user authentication - If I wanted to run the script as another user I would end up either prompting for the required credentials, or elevating privileges at run time, or even running Powershell as an administrator. 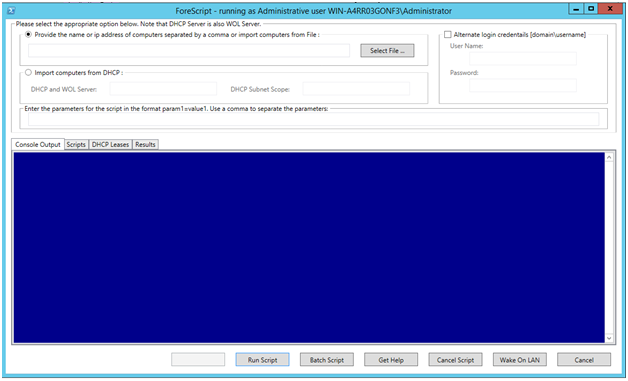 Formatting the output of the Powershell scripts for display purposes - This speaks for itself. I have written quite a few Powershell scripts that have code that is only used for converting the output into html. I could have written a module that would handle all of those issues for me and use that module in every Powershell script that I wrote. However I wanted to do much more than that. I wanted to create a framework that would support the execution of Powershell scripts. "The computer has rebooted from a bugcheck. The bugcheck was: 0x00000051 (0x00000004, 0x00000001, 0xe7079d70, 0x00000238). A dump was saved in: C:\WINDOWS\MEMORY.DMP." The assignment was very simple. All I had to do was to login into SQL Server Management Studio (SSMS), run a query , copy and paste the results of the query into an Excel Spreadsheet Template and then save that template using an agreed naming convention. The only problem was that I had to run the query with different parameters and that would mean doing it nearly one hundred times. So I dutifully began my task and after a few hours I had only extracted the data for about three of the scenarios. The way that I was going about doing the extract would take forever and a day and I did not have that much time. They say that "If you have a hammer, everything looks like a nail" and so I decided to use my Powershell hammer to nail my data extraction problem, so to speak. As far as I was concerned Powershell was the ideal tool for the job. I could use Powershell to run the queries against the SQL Server database and return the data in a dataset. Once I created the dataset I would then loop through the data and update each worksheet in the Excel Spreadsheet Template and then save the spreadsheet in the agreed naming convention. Life could not be easier. Please see the NODE.js version of this article. Large file uploads how do I love thee? Let me count the ways. These days having to deal with large file uploads is rather common place in IT environments, and by large file uploads I mean files that are over 500 MB in size. Sure we have replication technologies that can help us to keep our data in sync, but there is still that need to move large amounts of data on a regular basis. Most of the times that I had to move anything over 500 MB in size I would typically split the file into several smaller files using a file compression utility and then upload these smaller files via ftp or secure shell (ssh). Once all of the smaller files have been uploaded I would use the file compression to recreate the original file. However that required the setup of an FTP server or a Secure Shell server and the use of a third party file compression utility. So I asked "With the prevalence of web browsers and web servers in the IT environment could I accomplish the same thing using the HTTP protocol?" A quick search on the Internet showed that web servers will typically limit the maximum file size that can be uploaded to anywhere between 2 GB and 4 GB, and in addition to that most web browsers will allow you to upload around 2 GB. I suppose the reason for that is that the Content-Length header is being treated as a signed 32-bit integer in the web browser and the maximum size of a signed 32-bit integer is 2,147,483,647. As I continued to search I began to look at the HTML 5 specification and the APIs that are a part of that specification because the indication was that these new APIs would allow me to upload files greater than 2 GB in size over the HTTP protocol. I also came across examples of code on the Internet that indicated what could be done, but not a complete example of how it could be done.